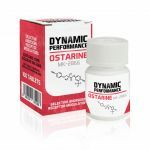 Cardarine has become increasingly popular among bodybuilders due to its amazing ability to increase intensity and energy whilst promoting rapid fat loss. Having initially been developed to cure the formation of tumours, there has been extensive research since its creation, leading to the discovery of the host of benefits that it has the potential to provide. The potential of Cardarine was quickly recognised by fitness enthusiasts, who have used it as a means of burning fat and increasing endurance. Up to now, no harmful side effects have been discovered, which is part of the reason that it has become such a staple in the cycles of countless athletes. Although Cardarine is not a SARM, it does work quite similarly in the sense that it also targets androgen receptors. In this case, the particular receptors that it targets are those that stimulate skeletal muscle tissue and glucose uptake. This means that it should essentially trick your body into no longer burning glucose for energy and instead make it burn fat. Cardarine has also been suggested as a treatment for obesity and is said to increase good cholesterol while decreasing bad cholesterol. Cardarine is used by a number of elite athletes in a wide variety of different sports due to its ability to provide unbelievable intensity during training. During a cycle, you can expect to see significant improvements in your energy and endurance, as well as increased fat loss and much shorter recovery times.